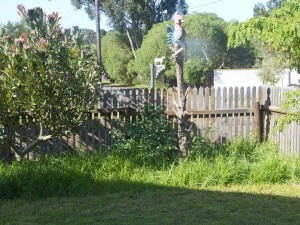 Home > Blog > Barbie's garden > What’s this? While I’ve been cleaning up my garden and planting seedlings, I have been watching these two strange “weed” bushes developing in the corner where the old conifer tree was. I wanted to see what they would eventually become, but I am now curious to know what the dickens these are! The first bush has a very familiar looking flower – similar to a tomato and the actual potato plant! Then, right next to this plant is this alien looking thing! 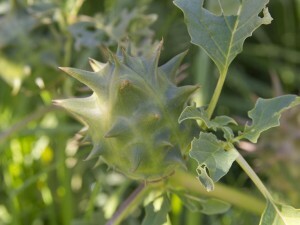 Quite a scary looking horned-pod head!! 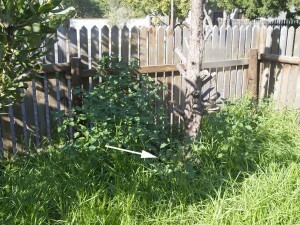 The rest of the plant is unassuming and quite small. No flowers anywhere. I would love to know what this is! Look at this weird thing! Any ideas? I hope one of our gardening buddies can help solve this mystery! I am a follower of your blog, from South India. 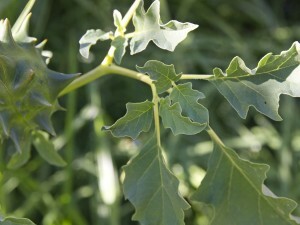 The first one could be Solanum nigrum as you mentioned. But I don’t know it is an edible one. 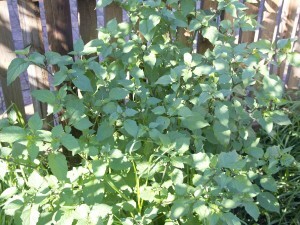 In India, particularly in Tamil Nadu, the edible version of this plant is considered as a spinach and consumed by people as a curry or soup. It is good for mouth ulcer. Kids used to eat the fruits and the unripened dried fruits are cooked with tamarind. I guessed night shade correctly for the first one but was clueless for the second one. At least your mystery plants are interesting looking! Thanks- I’m having difficulty identifying the second plant. I am still doing research. 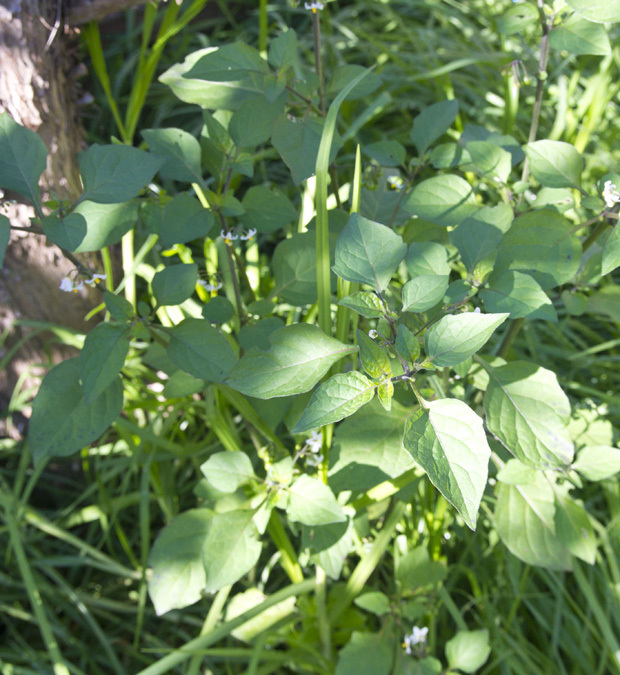 Well – I did some research and it is definitely Black Nightshade (Solanum Nigrum). Most web sites say it is highly poisonous, especially to horses. So it is OUT! The other is also going, but need to do some research as to what it is! 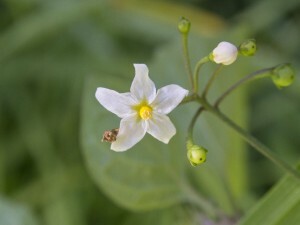 It is Solanum jasminoides and whilst it was very pretty as a small plant and when in flower, for the rest of the time I can actually live without it. Nothing special. I won’t plant it again. Yes – you are right it is a Solanum but I think mine is a weed!! It could be Black Nightshade. I’ll have to do some Googling on both these plants. At least I now know where to look. 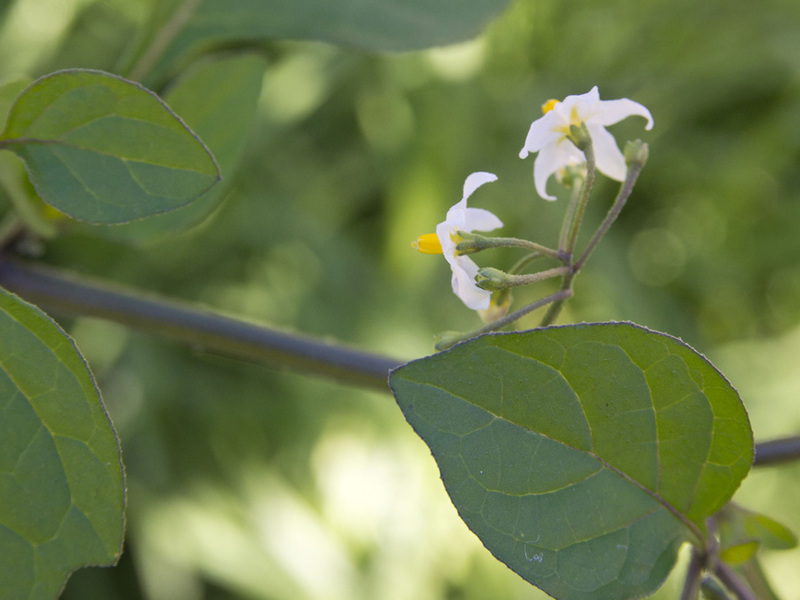 The first plant looks like something the older folks call “nastergal” (Afrikaans), night shade in English and scientific name “Solanum nigrum”. The flowers turn into purple berries, very bitter off the plant, but used to make lovely jam. The second one looks rather scary…. there is a just sommer weed called Solanum, that might be your top one. You could Google ‘search by image’, for the distinctive seed pod below. EEk! Will pull that nightshade out pronto. The first plant looks like something in the deadly night shade family. Haven’t heard from you two in a while. I was wondering what is going on. Thanks Carolyn – yes, it seems unanimous so I’m just going to pull it out if it’s poisonous. We have been quiet, not intended. Both of us had our bouts of flu and sinusitis and then the work was piling up. Now back on track! 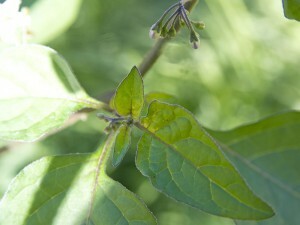 The first one is nightshade I believe… I’m not sure of the exact species. 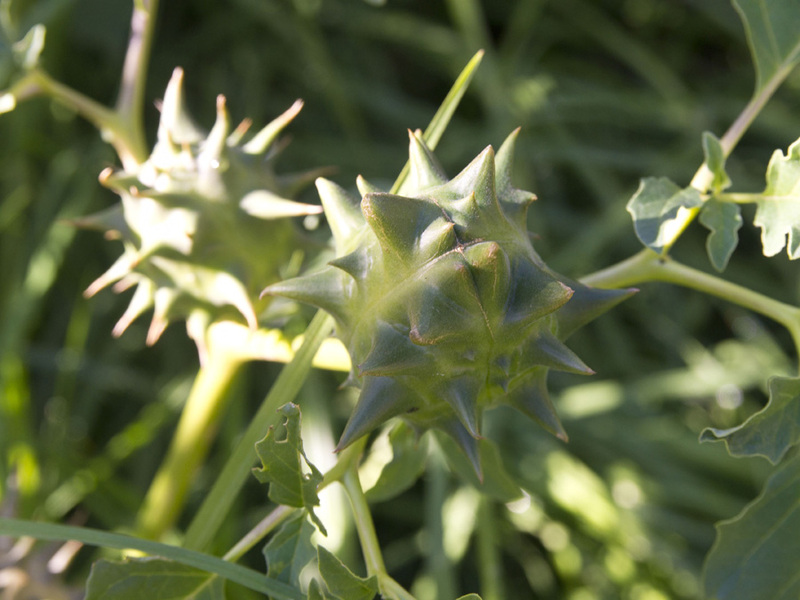 The second one with the horny pod… you never saw flowers? My first guess is a Datura of some kind, but that could be way off. You are on a different continent after all. 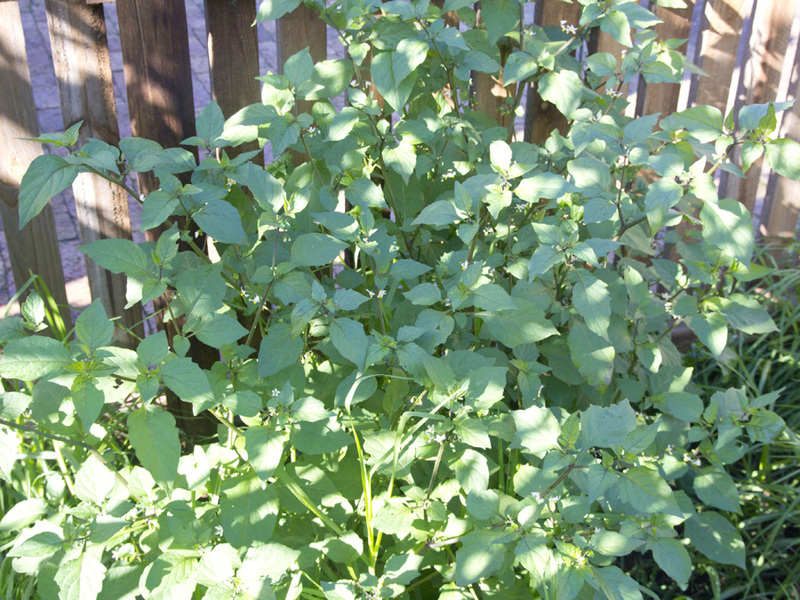 Thanks Alan – it just grew there so must be a weed – nightshade. Will just pull it out! The other I will have to Google!